On Sunday night (July 21), the planet Venus passes just north of the bright star Regulus in Leo. July has been full of encounters between astronomical objects, and the action continues this weekend with three different planets taking center stage. The moon and the star Spica have already lined up this month, as have Mars and the star cluster Messier 35. Now Venus is set to dance with the bright star Regulus on Sunday evening (July 21), while Mars and Jupiter have a date the following morning. 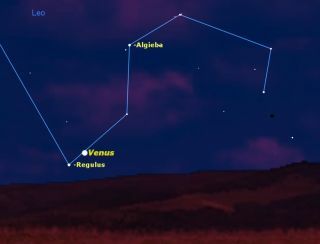 This Sunday, look for Venus close to Regulus in the western sky just after sunset, in the constellation Leo (The Lion). Although Regulus is one of the brightest stars in the sky, Venus is far brighter and will thus be much easier to see. Once you spot Venus, look below and to its left to see Regulus. If you’re south of the equator, Regulus will be above and to the left of Venus. Later that night, an hour before dawn on Monday (July 22), look in the northeastern sky to see Jupiter and Mars rise together in the constellation Gemini (The Twins). Jupiter will be the brighter of the two planets, with reddish Mars above and to its left. If you’re in the southern hemisphere, Mars will be below and to the left of Jupiter. If you have access to a telescope, these paired planets will make an interesting sight, with Jupiter accompanied by its four bright Galilean moons — Io, Europa, Ganymede, and Callisto. An hour before sunrise on Monday (July 22), the planet Mars passes Jupiter. What will be most noticeable is the tremendous difference in size between the two planets. While both are on the far side of the sun, Mars is much closer than Jupiter. Even so, Jupiter will appear more than eight times larger in diameter than the Red Planet. Editor's note: If you snap an amazing picture of the night sky that you'd like to share for a possible story or image gallery, send photos, comments and your name and location to Managing Editor Tariq Malik at spacephotos@space.com.